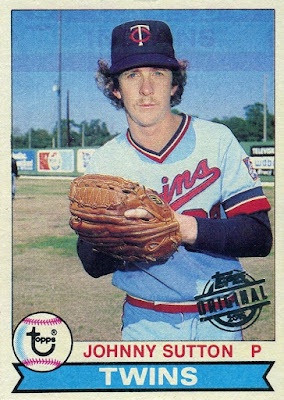 Bo over at Baseball Cards Come to Life! posted a comment on my blog asking if I wanted some 2008 Topps Baseball. I love the design of 2008 Topps and I had only a few from this set so I was absolutely interested. After some e-mailing back and forth we were able to settle on a trade. Fortunately he needed a lot of base cards from sets within the past couple years so I was able to offload a lot of duplicates. The trade package arrived on Monday. As I write this on Tuesday night, I have a big interview on Wednesday I should be prepping for but I'm too excited about this trade. I went from own 9 cards in the set to a whopping 374, for a net of 365 cards! (Over at Sports Card Collectors he is running a contest for 2016 Donruss Football. Considering I purchased a pack of these cards just yesterday, it is rather fortuitous that he has a contest for this set. This gives me a good incentive to write a review of my pack as well as to encourage you all to go enter). After a few weeks of checking every time I shopped, my local Fred Meyer had finally restocked its card selection. Now either they don't do a good job ordering cards or if my town really enjoys their cards because the store seems to go through it's card selection rather quickly. Either way, the small card section contained several new products, including 2016 Donruss Football. I'm always eager to try out new sets during my first year back into the hobby. I happily picked up a larger rack pack; 20 cards for $4. The breakdown of the pack was 14 base, 3 parallels, 2 rookies, and 1 insert. The base cards bare some resemblance to the base of 2016 Donruss Baseball, mainly with the stripes on the sides of the cards. 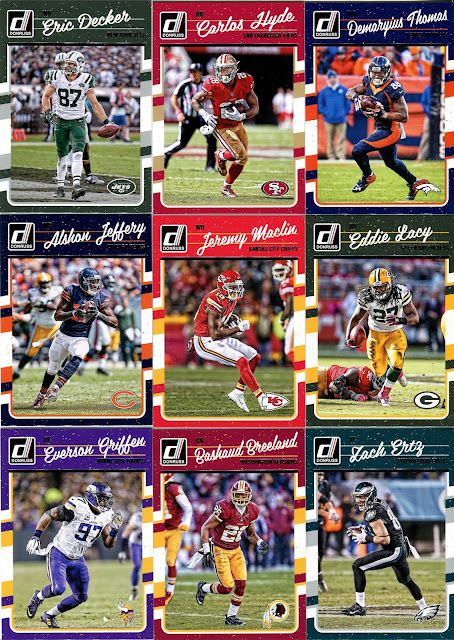 However, I find the football cards to be more visually appealing. Each card pops with color that fills the whole border. 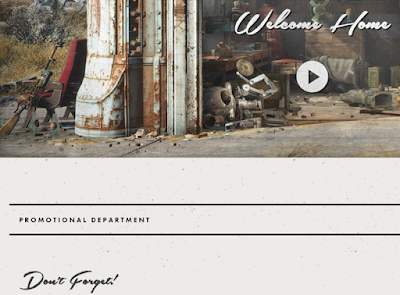 The name plate at the top reminds me of notebook paper, especially with the cursive writing. The font choice for the names is excellent. Some sets use cursive font as way to add perceived value to the cards to either make it look like a real signature or because the designers think nearly illegible cursive is fancy. Here Panini is clearly not attempting to recreate signatures. I feel like this font gives off a colorful vibe to go along with the rest of the card. My biggest complaint is that the team name and position are in a small font that can be hard to notice. Moreover, the team and position are in foil letters, which further creates visual strain. When looking at these cards I hardly notice the team and position most of the time and I almost would have preferred if Panini left them off. 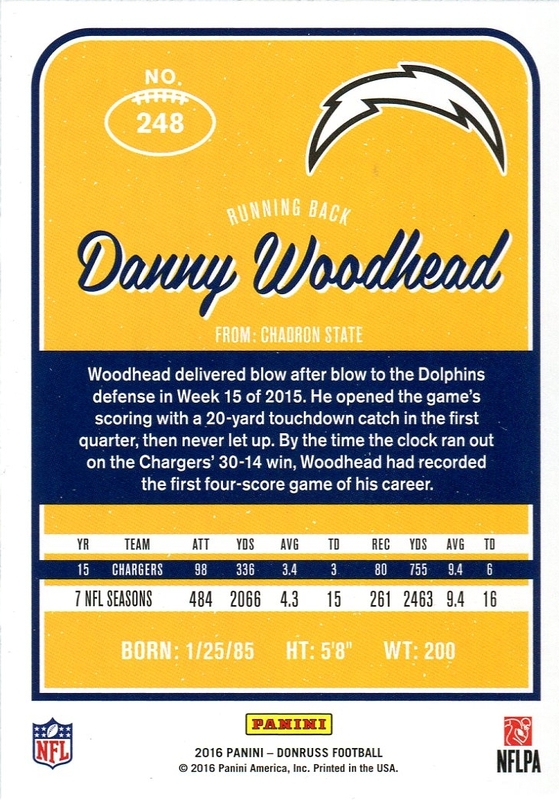 The card features the team logos prominently in the lower right corner, which would have been sufficient. In typical Panini fare, this set has only one year of status. The colors again pop on the back and mirror the colors on the front. The back has a clean look to it and I just realized this as I'm typing but the font gives me a 1960s/Fallout 4 vibe. Can a font be carefree? Because that's the feeling I get when I look at the back of these cards. For such a violent sport, my feeling could not be more opposite to the sport itself. Anyway, I'm too distracted by the font to finish talking about the back of the card so let's change subjects. A new set is not complete without some rookies. At the top is a Cody Kessler Rated Rookie and at the bottom is a standard Karl Joseph rookie card. As you'll see below, the Rated Rookie cards all look the same from a design standpoint. They also appear to feature staged photos of the players, rather than action shots. I have no idea why some cards are Rated Rookies and some are not. The base rookies look exactly like the base cards. I am perfectly okay with that. Although, I'm mostly certain that the photo of Joseph is Photoshoped. There would have been no opportunity for Panini to get a photo of him, in a Raiders uniform, in a stadium. I say well done to Panini because this is a clean edit. I have little to add about these blue Press Proof parallels other than they are stamped in blue with foil lettering stating Press Proofs. These are not numbered. The team name and position lettering is also blue foil. This shade of blue is a nice choice. The lone insert of the pack, a Legends of the Fall insert. I'd rate this set a solid "meh" in terms of theme and player. What do I think of this set? 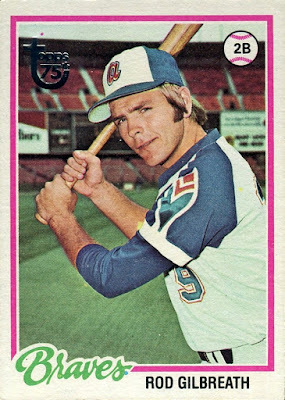 Well, Donruss has a "Donyess" on it's hands. I've come to realize that I prefer more of the low-end sets because the designs don't seem as pretentious. This set fits that mold. I'm a man with simple tastes. I hope to pick up more of these cards. 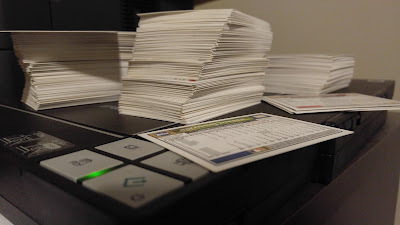 The concept of buyback cards was foreign to me until I won on Sportlots a Series 2 lot of 2015 Topps. Included in the lot were two Topps buyback cards. I don't know when exactly Topps started its buyback program but I believe it's only been in the past couple years that Topps has stamped the cards. 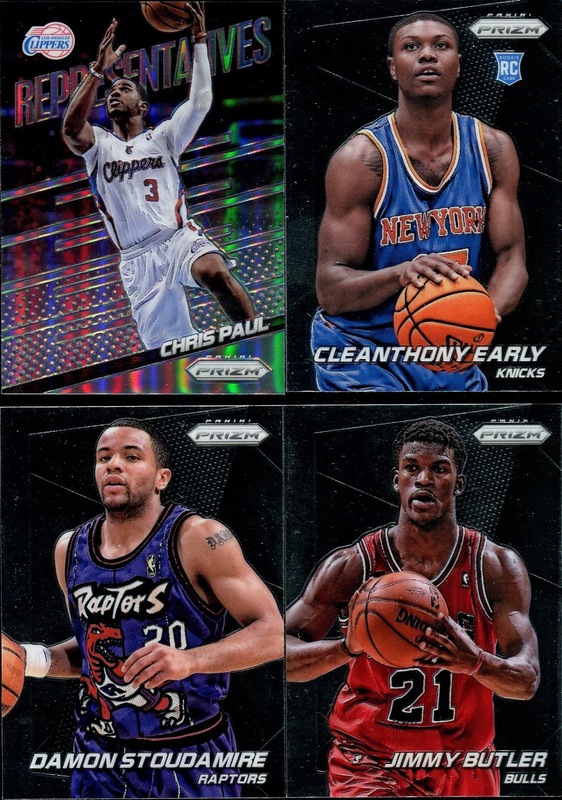 Since buybacks are not new topic there has already been plenty of digital ink spilled talking about these cards. That won't stop me from giving my own $.02, though. In my experience so far, all of my buyback cards have been from the 1970s. 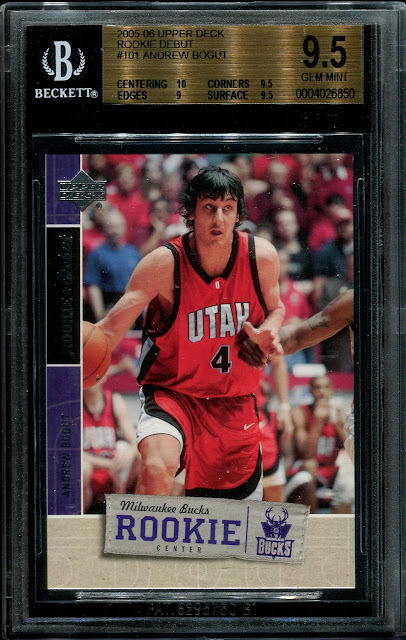 As I mentioned in my trade post documenting my first vintage basketball cards, the vintage cards have a classic look and feel to them. I don't need an all-star player to feel like I had a successful pull. Any card is fine by me. 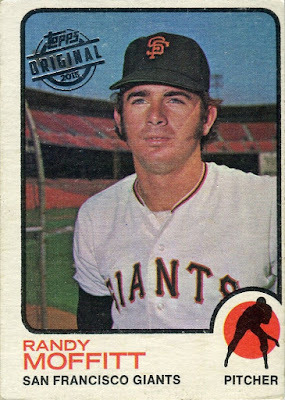 Some critics might argue that if collectors want vintage cards they should just go out and buy the originals and keep the buybacks out of the modern sets. It's fair point but I personally wouldn't seek out these cards on my own. I'm not at the point where I'm trying to collect vintage cards. Any buybacks I receive I consider a special surprise. There is also the question of value. Are buyback cards more valuable than the originals? I have not performed any comparison research but my gut answer would be no. I don't think the stamp adds any intrinsic value beyond the original. Or rather, the unstamped version. 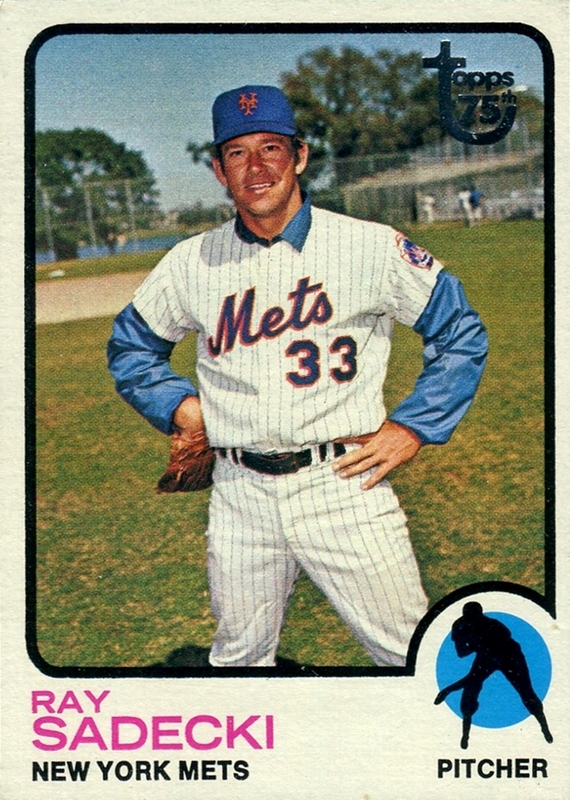 The downside to the buyback cards is that it is nearly impossible to put together a checklist. 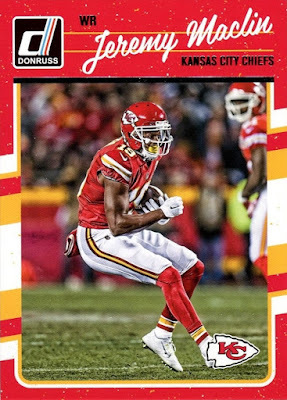 Topps never releases a checklist of all the buyback cards they've inserted into boxes and I doubt Topps even knows which cards are shipped off. Collectors don't even know how many different buyback cards are out there. Another thorny issue is the matter of cataloging and sorting buyback cards. At least on the Trading Card Database, with no set checklist the cards cannot be added to my collection. I've resorted to cataloging the card under it's original set. I then scan the front of the buyback and upload it to my collection. That way the stamped version will show up in my collection gallery. When I sort the card I put it with the set that it was pulled from. For example, the Ray Sadecki card was pulled from 2014 Topps Update. Therefore, I will keep it sorted with the rest of my Update cards. I also make a note in my collection on TCDB that it's sorted with Update so I can find it easier at a later date. Will Topps continue the buyback program for 2017 flagship? Given that there is no shortage of cheap commons out in the world, my money is on "yes." Opening retail packs are fun because they provide instant satisfaction. Yet as we all know, the odds of getting good cards in a retail pack can be astronomical. Hobby packs can be a much better experience as the odds are improved. For those who don't have easy access to a LCS to buy hobby packs, in steps in The Loot Locker. For $20 (+ $5 shipping), the Loot Locker sends out at least 3 hobby packs [UPDATE: I've been informed that some months there could be more than 3 packs] of your choice of baseball, basketball, football, and hockey. The packs are voted on by their Twitter followers and from what I've seen the packs are all from recent releases. After hearing about Loot Locker I purchased a baseball locker for July to see what it is all about. What was in the box? Let's see. 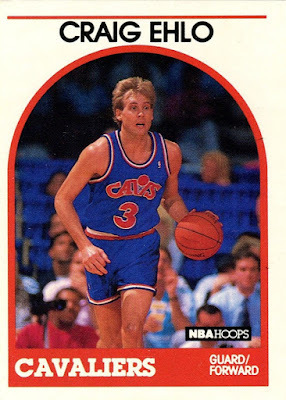 After I posted about basketball cards during the baseball all-star game, Tony, over at Off Hiatus Baseball, asked me if I wanted his basketball cards. Never one to turn down cards, I happily accepted his offer. Tony is a Milwaukee Brewers collector and unfortunately my Brewers collection is pretty slim outside of the base cards. Nonetheless, I managed to scrape up a couple cards that Tony didn't have and sent them on their way. You can see Tony's write-up on his end of the trade over on his blog. 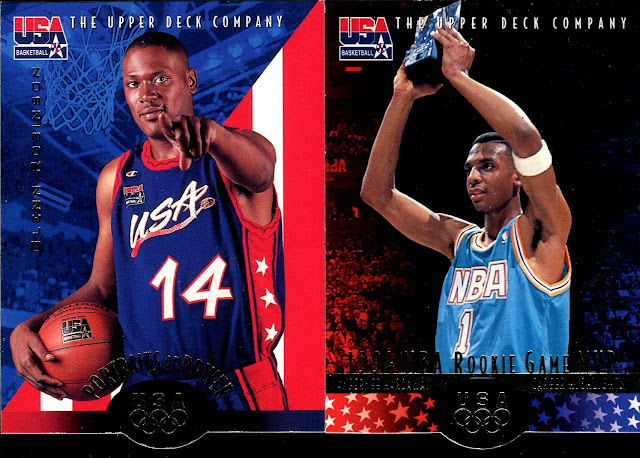 In the spirit of the Olympics, I'll start with the 1996 Team USA cards. Although this wasn't the caliber of the original Dream Team, the 1996 team was still stacked with greats like Grant Hill, David Robinson, Hakeem Olajuwon, and Scottie Pippin. The above cards feature Glenn Robinson and Anfernee Hardaway. This set even included the women's team, which is nice. I have two complaints about this set. First, the small bump at the bottom of the card. The bump makes these cards harder to store and as a design element it feels unnecessary. My other complaint is that there are not any cards for The Glove, Gary Payton. 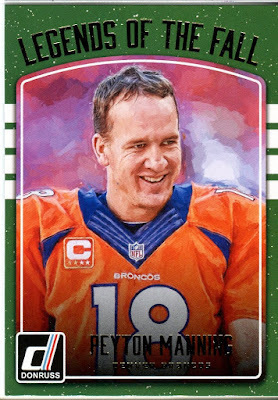 Maybe Payton was a late addition to the team or the team wasn't set at the time the cards went to print. Either way, it's a small disappointment. Even if these were the only cards in the trade, I would have been satisfied. Next up, a great set of cards. The 1991-92 Upper Deck series is tastefully done. UD didn't overdo it with the basketball border. Two of the three top cards were Sonics. I always appreciate anytime I can expand my Sonics collection. 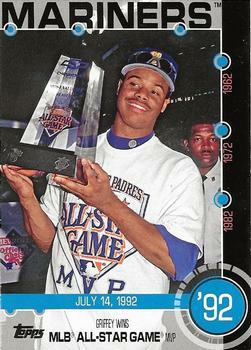 Hersey Hawkins wasn't a Sonic at the time and wouldn't be until the 95-96 season. I love seeing old school Dennis Rodman photos, before he became "The Worm." Rodman was my favorite player as a kid. His play backed up his attitude too as he was an excellent rebounder. 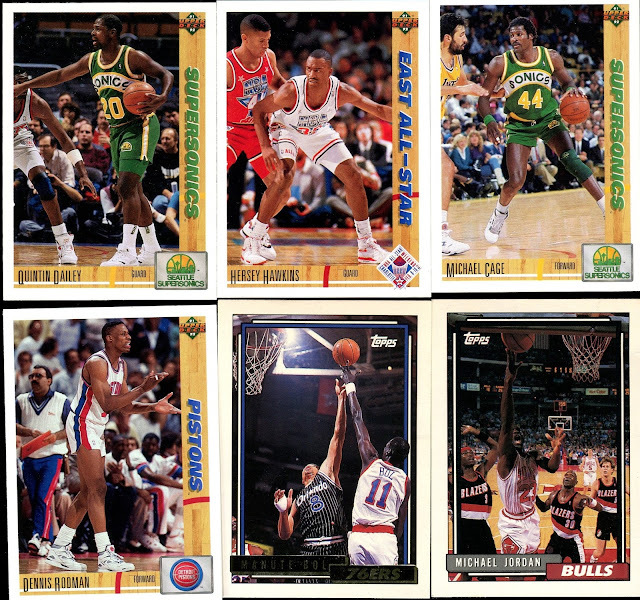 The 92-93 Topps set might be my favorite looking basketball set and is one I hope to complete someday. Great use of team colors in the name/team boxes. The single-lined borders are subtle touch that are not too distracting. Despite living in Celtics territory as a kid, I was a big Bulls fan. Michael Jordan was responsible for that. The gold Topps cards, while nothing spectacular, do a good job of adhering to the base set look. Sometimes parallel cards aren't as good as the base but here the gold is just fine. Craig Ehlo probably isn't a notable name for many people, unless you're talking about the time that Jordan burried a game-winning shot over Ehlo. However, that's not why he sticks out in my mind. He graduated from Washington State University, which is where I graduated from undergraduate. Not many WSU players make the NBA so any time such a player does make the NBA, I root for them no matter what. Ehlo also played one season with the Sonics, although he was hardly effective. Lastly, Ehlo spent some time doing broadcasts for the Gonzaga Bulldogs, another team I support. He developed an addiction to pain medication but appears to be turning his life around now. A very small three card set of holograms. The scans do not do these cards justice. The 3D effect of the cards works well in person. I have to admit I was surprised to see a few modern cards in this trade package. Almost every other card was from the 90s or earlier so to have essentially new cards was unexpected. I don't have much to say about these cards as I don't care much for the Prizm brand. Some nice players though in Paul, Stoudamire and Butler. Another surprise and in the best way possible. I've never submitted any cards for grading and I am undecided if I would do so in the future. However, the presentation of a slabbed card is well done. This card received a high 9.5 grade so I'm sure I will be retiring soon with this Andrew Bogut rookie as my gravy train. Seriously though, this is a unique card to have so thanks Tony for sending it along. Last but not these are a trio of vintage cards. I believe these are the first vintage cards I have in my collection. I didn't understand the appeal of vintage cards until I had one in my hands. The design focuses on the player, who can get lost in today's cards. They also have a nice feel to them as the cards are indeed made out of cardboard. That wraps up this trade, thanks again to Tony! Two weeks ago, Ken Griffey Jr. became the first Seattle Mariner to be inducted into the Hall of Fame (HOF). 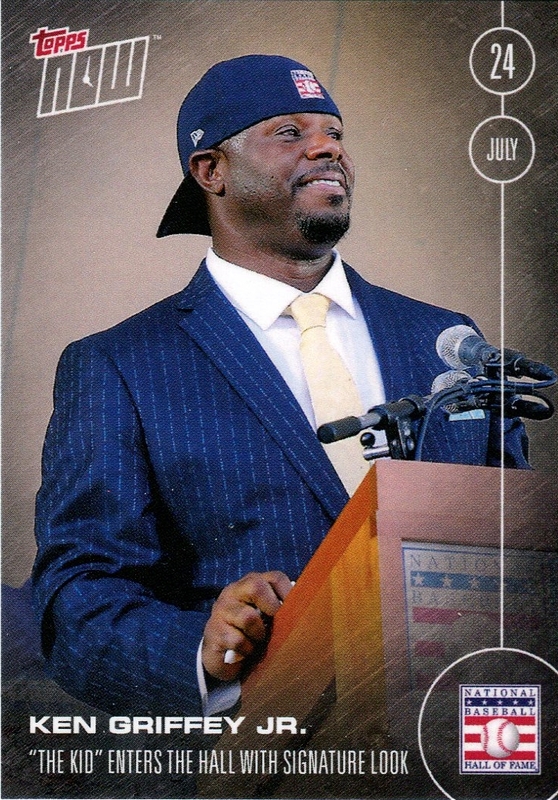 Rightly so, many card bloggers posted their card tribute to Griffey during HOF weekend. I had considered that but I wanted to add a local flavor to my post. 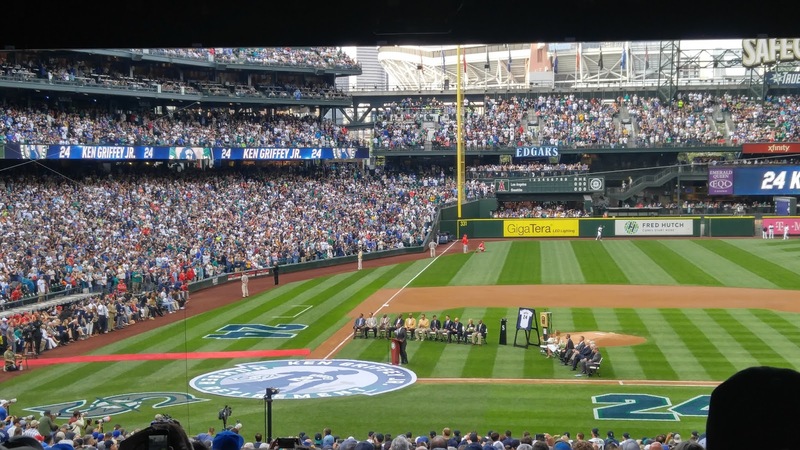 This weekend, the Mariners hosted their own induction ceremony for Griffey on Saturday. I was lucky enough to attend the game and decided to share some thoughts from the game. 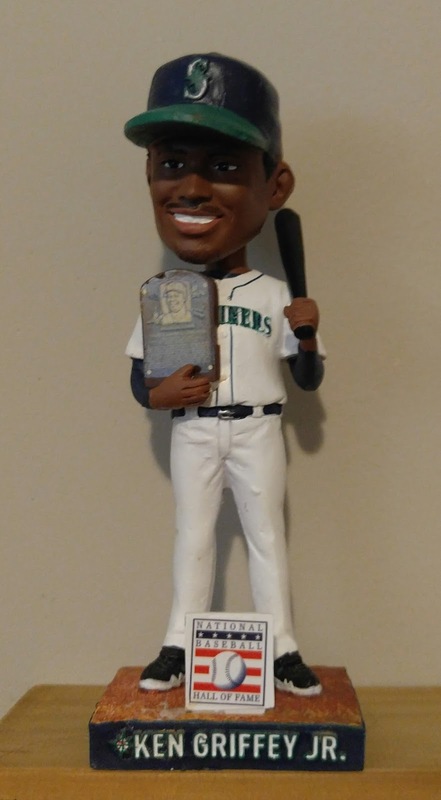 The bobblehead was actually from Friday's game, which I did not attend. Thankfully my brother-in-law went to game and scored the bobblehead for me. 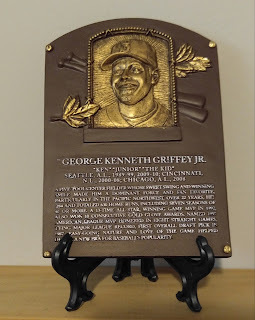 As you can see, Griffey is holding his HOF plaque. Griffey will sit alongside my Dave Niehaus bobblehead, who was also inducted into the HOF but as an announcer. 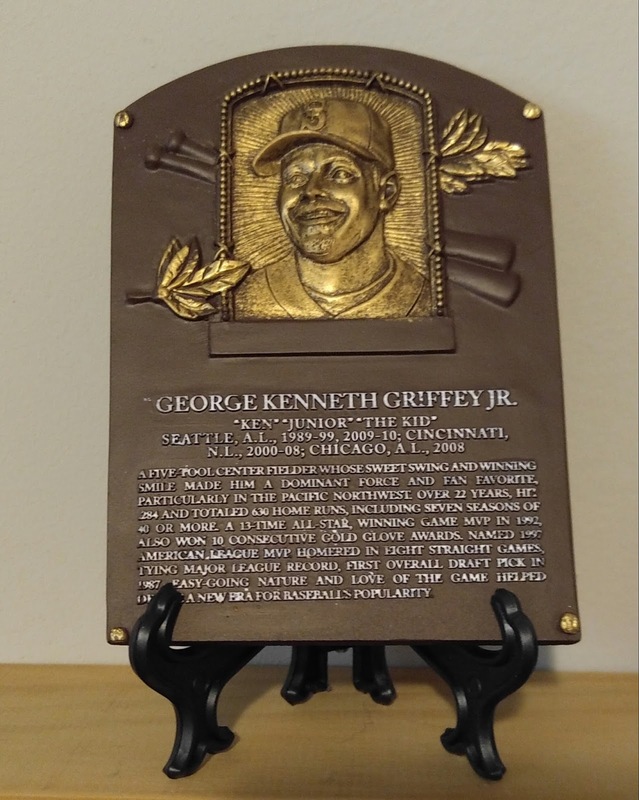 The giveaway for Saturday's ceremony was a mini replica HOF plaque. They had the real thing there that was available for a photo opportunity but the line to see it was very long. I would have missed the whole game waiting to see it, which I'm glad I didn't as the game was an exciting comeback victory. It's not as if this would be the only time to see the plaque as I could always go to Cooperstown. The Mariners pulled out all the stops for Saturday's ceremony. 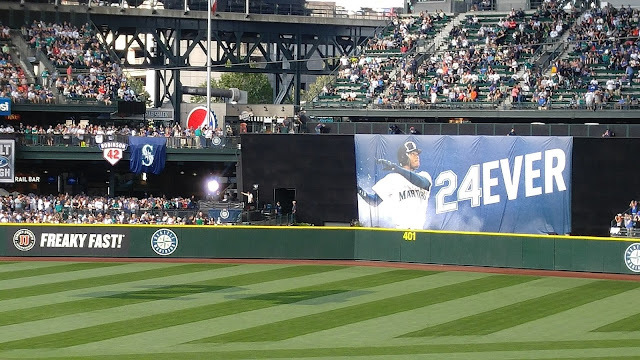 The giant banner, his number painted in center field, the number going up next to Jackie Robinson's. It was a great ceremony. 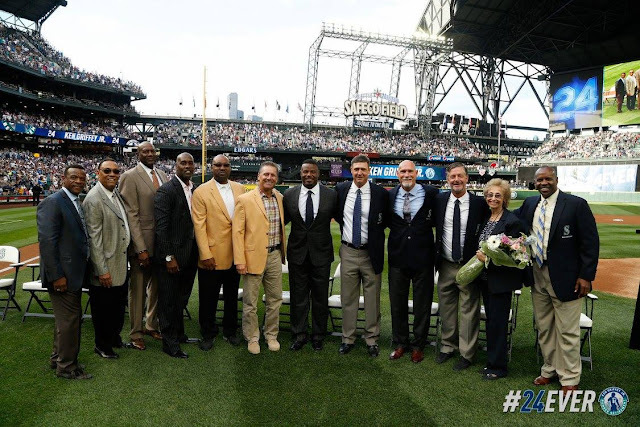 Seattle legends came out to support Griffey, including Dan Wilson, Jay Buhner, Alvin Davis, Jamie Moyer. Not only that but other Hall of Famers such as Steve Largent, Cortez Kennedy, Spencer Haywood, Tony Perez, Gary Payton, and Ricky Henderson showed up. WOW. I mean, my god, the talent on that field. There were also video messages from greats like Willie Mays, Kobe Bryant, Jeff Gordon, and Hank Aaron. Mays had a funny story saying that he called Griffey when the official vote talley was announced. 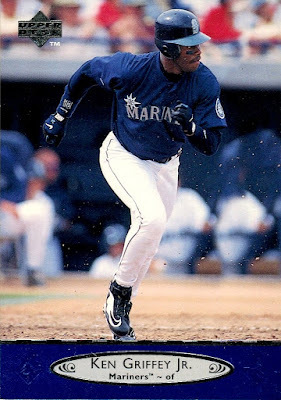 However, Griffey didn't answer his call and never called him back. In the video, Mays told Griffey to call him sometime, which Griffey did right on the field. Great stuff. Now onto the cards. I don't have many Griffey cards but according to my collection on TCDB I have 18 different cards. Eighteen is good enough to be ranked #2 in my collection, only behind Ichiro. I'm glad he's ranked so high but for a player with so many cards, it could be higher! The bulk of my Griffey cards are from early on in his career. I think growing up one of my favorite cards was the 91 Score card. It's a great image that captures his sweet swing. This is from a full set of 20 cards that was given away at a Mariners game. I wish teams did more card giveaways at games. 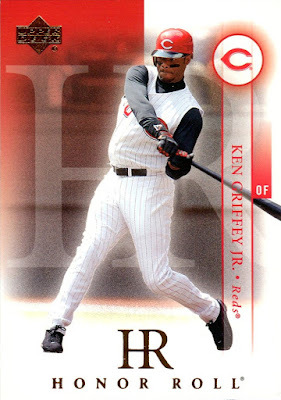 The only Reds Griffey card in my collection. The Tribute to the Kid insert below doesn't count as those aren't base cards. A nice tribute card to Griffey's 1997 AL MVP season. 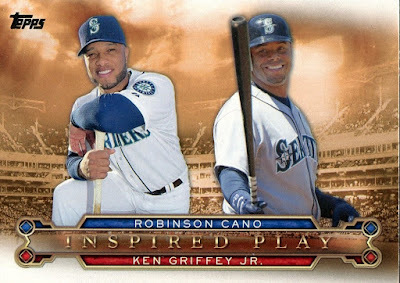 The Tribute to the Kid insert from this year's Topps celebrates Griffey's career. It's a nice retrospective and it's a good sized set that isn't difficult to complete. 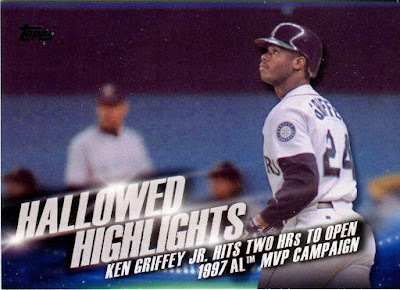 The latest addition to my Griffey collection is the Topps Now card from his HoF induction. I like the idea of Topps Now and the execution based on my one-time experience is satisfactory. The card selection, however, is very hit and miss. The player selections skew heavily towards teams you would expect like Yankees, Red Sox, Cubs. 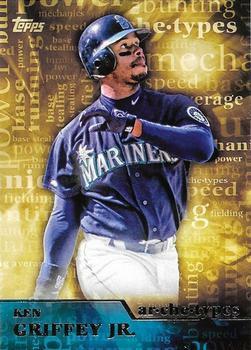 The Mariners have had a decent number of cards but as of late they have been all but ignored. Flame throwing rookie Edwin Diaz, called up from AA and striking out players at a high clip? Nah. Mariners retire Griffey's number and Hall of Famers across multiple sports show up? Nope. Mariners sweep the Angels? Forget about. But don't worry, Trout got two cards this weekend. Anyway, rant over. The card is nice but at $10 a pop it won't be something I buy again. I can't justify the cost for one card for an event that will be largely forgettable by the end of the year. Unless the Mariners win the World Series, I'm done. 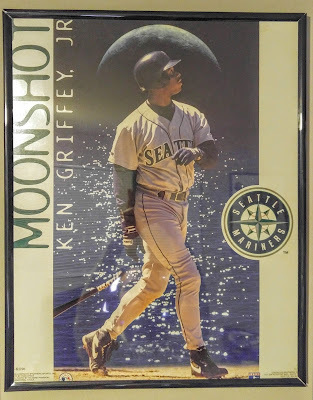 That wraps up this Griffey post. 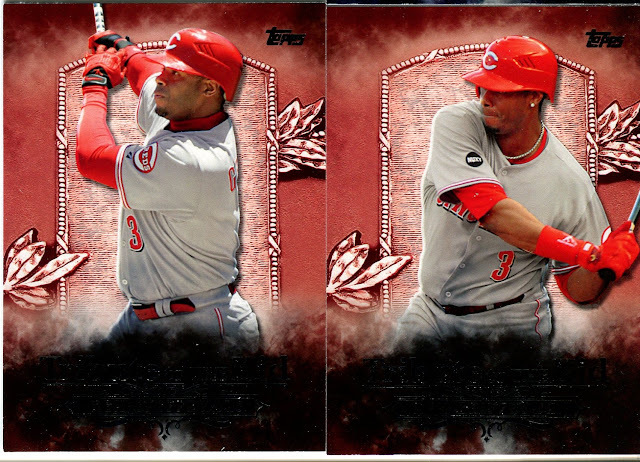 I'm sure we will see new Griffey cards for years to come.